Caroline Foucher obtained her Master’s degree in Materials Physics in 2010, from the University of Salford in England. Her Master’s dissertation focused on the comparison of various materials properties for the fabrication of solar panels. She then moved to Scotland to do her PhD at the Institute of Photonics of the University of Strathclyde, under the supervision of Prof Martin Dawson. Her thesis, named “Solution-processable, mechanically flexible lasers” explored various materials, designs and fabrication techniques to improve the capabilities of plastic lasers. After completing her PhD in March 2015, she was offered a posdtdoctoral position at the same Institute, but this time working on visible light communications (LiFi). She designed and fabricated colour-converters with various materials, such as quantum dots and organic semiconductors, in order to transmit fast data throught microLEDs and make them suitable for visible light communications. In July 2016, she then moved to Singapore as she started a postdoctoral position in Nanyang Technological University, under the supervision of Prof Volkan Demir. Her research still focused on colour-conversion but also on quantum dot lasers. 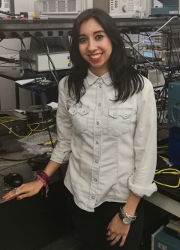 She then joined Prof Roberto Morandotti’s group in September 2017 where she mainly focuses on optimising the interface between nanolaser devices and optical fibre-based systems. InGaN micro-LEDs integrated onto colloidal quantum dot functionalised ultra-thin glass, K. Rae, C. Foucher ,B.Guilhabert, B., M.S. Islim., L. Yin, D. Zhu, R.A. Oliver., D.J Wallis, H., N, and M.D.Dawson, published in Optics Express, volume 25 (2017). Fluorene-containing tetraphenylethylene molecules as lasing materials C. Orofino-Peña, C. Foucher, F. Farrel, N. J. Findlay, B. Breig, A. L. Kanibolotsky, B., F. Vilela, P. J. Skabara, N. Laurand, and M. D. Dawson, published in Journal of Polymer Science, Part A, volume 55 (2016). RGB and white-emitting organic lasers on flexible glass C. Foucher, B. Guilhabert, A. L. Kanibolotsky, P. J. Skabara, N. Laurand, and M. D. Dawson, published in Optics Express, volume 24 (2015). Hybrid organic semiconductor lasers for bio-molecular sensing A.-M. Haughey, C. Foucher, B. Guilhabert, A. L. Kanibolotsky, P. J. Skabara, N. Laurand, and M.. Dawson, published in Faraday Discussions, volume 174. Diode-pumped, mechanically-flexible polymer DFB laser encapsulated by glass membranes C. Foucher, B. Guilhabert, J. Hernsdorf, N. Laurand, and M. D. Dawson, published in Optics Express, volume 22, issue 20 (2014). Wavelength-tunable colloidal quantum dot laser on ultra-thin flexible glass C. Foucher, B. Guilhabert, N. Laurand, and M. D. Dawson, published in Applied Physics Letters, volume 104, issue 14 (2014). Nanosecond colloidal quantum dot lasers for sensing B. Guilhabert, C. Foucher, A.-M. Haughey, E. Mutlugun, J. Herrnsdorf, H. D. Sun, H. V Demir, and M. D. Dawson, published in Optics Express, volume 22, issue 6 (2014). Highly-photostable and mechanically flexible all-organic semiconductor lasers C. Foucher, B. Guilhabert, A. L. Kanibolotsky, P. J. Skabara, N. Laurand, and M. D. Dawson, published in Optics Materials Express, volume 3, issue 5 (2013). Transfer printed multi-color integrated devices for visible light communication applications, OSA Light, Energy and the Environment Congress, Leipzig, Germany. (2016). Laser-excited 580 nm AlGaInP nanomembrane for visible light communications, OSA Light, Energy and the Environment Congress, Leipzig, Germany (2016). InGaN micro-LEDs integrated onto an ultra-thin, colloidal quantum dot functionalized glass platform, IEEE Photonics, Hawaii, USA (2016). Functional ultra-thin glass structures for colour-conversion , ISFOE16, Thessaloniki, Greece (2016). Mechanically-flexible organic lasers fully encapsulated with ultra-thin glass membranes, Rank Prize Funds Symposium on Exciton Processes in Molecular Materials, Grasmere, England (2015). Flexible glass for organic lasers, ISFOE15, Thessaloniki, Greece (2015). Diode-pumped, mechanically-flexible organic lasers fully encapsulated with ultra-thin glass membranes , IEEE Photonics, San Diego, USA (2014). Colloidal quantum dot lasers on ultra-thin glass for flexible photonics, SPIE, Brussels, Belgium (2014). Mechanically-flexible colloidal quantum dot lasers on ultra-thin glass, Quantum Dot Day, Sheffield, England (2014). Flexible Polyimide-based Nanocomposite Laser, EOSAM, Aberdeen, Scotland (2012).